Taken in July 1987, at the Narrows, Schroon Lake, NY, on our first date. I am sitting in the truck listening to the thunder erupt in the distance. The blackening skies and the gentle raindrops spattering the windshield explain the delay in Abigail’s track meet. Another boom causes me to add another thirty minutes to the delay. Will this track meet ever get underway? I don’t like delays. I am the kind of person who likes to get on with things. Let’s make a list and get it done. Even with track meets, I want to go and enjoy the races and then head home to get to the next thing. But that is not the way life works. Sometimes the rain and the thunder force us to wait. God loves to give gifts. He gives many to all of mankind. The sun, flowers, blue skies, family, and friends are all examples of the blessings He bestows on all people. But for those who belong to Him and walk according to His ways He gives special attention. He does not withhold any good thing from His own. But sometimes there is a delay to His blessings. Sometimes our all-wise Father sees fit to make us wait. Twenty-nine years ago Dad was very involved in Campus Crusade for Christ (now Cru) while studying at Miami University in Oxford, Ohio. In the Spring of 1987 he decided to apply for a summer mission trip to North Myrtle Beach, South Carolina, where he would spend time on the beaches talking to people about the Lord. He eagerly filled out his application and sent it, hoping to receive acceptance quickly. As a second option, he sent another application to a camp in Speculator, New York – Camp of the Woods. Time passed and Dad did not hear back from the organizers of the summer mission trip. He was still hopeful and continued to wait, but finally, when it came down to the wire, he needed to make a decision. Reluctantly, he accepted a position as a youth leader at Camp of the Woods. A few days later the acceptance came for the beach trip, but the die had already been cast. He would be going to Speculator, NY. He did not know why God had delayed the acceptance for his first choice until sometime later, but God had something special for him at this camp. Soon after arriving he met a young, blonde New Jersey girl whom he eventually married – yes, that was me!!! How thankful I am for God’s delays. If that acceptance had arrived a few days earlier, Dad and I would most likely not have met and none of you would be here either! The raindrops are getting stronger. In fact there is some hail falling from the sky. The phone rings and Abigail informs us the track meet is cancelled. What a bummer! But I am not going to worry about it. God knows the reason for the delay and cancellation. One day we may just find out that this unplanned circumstance produced a blessing that was exactly what God had in mind all the time. After all, twenty-nine years ago God’s delay equalled 1+5 blessings – I met the wonderful man who would become my husband, and with whom I would receive five wonderful children! Every once in a while it happens! We have an auction. We collect payment. We deposit the money in the bank. And a few days later we receive an official letter informing us that a check was returned for insufficient funds. Whether you are the writer or the depositer of the check, it is so frustrating to receive this notification. Upon writing or accepting the check, you trust that behind each small slip of paper there is money to back up the promise. But sometimes it just isn’t there. There are many different reasons for this occurrence. Sometimes people knowingly write a check without the appropriate funds in the bank. Other times it is just a miscalculation of what is available. But either way the result is the same: a returned check and a big headache. I am so grateful that when God makes a promise He always keeps it. If we who believe in Him keep His commands, do the things that please Him, and pray with a request in line with His will, we can have confidence that He will hear our words. Not only that, but if He hears our requests, we can be sure that we will receive what He has promised. Even when the answer is not clearly observable, we can have the assurance that God has heard and will answer our petition in His way and His timing. Our God will never willingly mislead us. He will never run short on supply and fail to come through. When we come boldly before His throne of grace we will always find mercy and grace to help us in our time of need. Every once in a while you might give or receive a check that will bounce. But when God says something, His word will never be returned for insufficient funds. Confidently rely on what He pledges. That is a promise you can take to the bank! I am fascinated with clocks. When Great Grandma passed away I was thrilled to inherit her grandfather clock. I remember visiting her when I was little and listening to the chimes of the old clock striking every quarter hour. There was something intriguing about the consistent ticking and the slowly moving hands making their rounds. 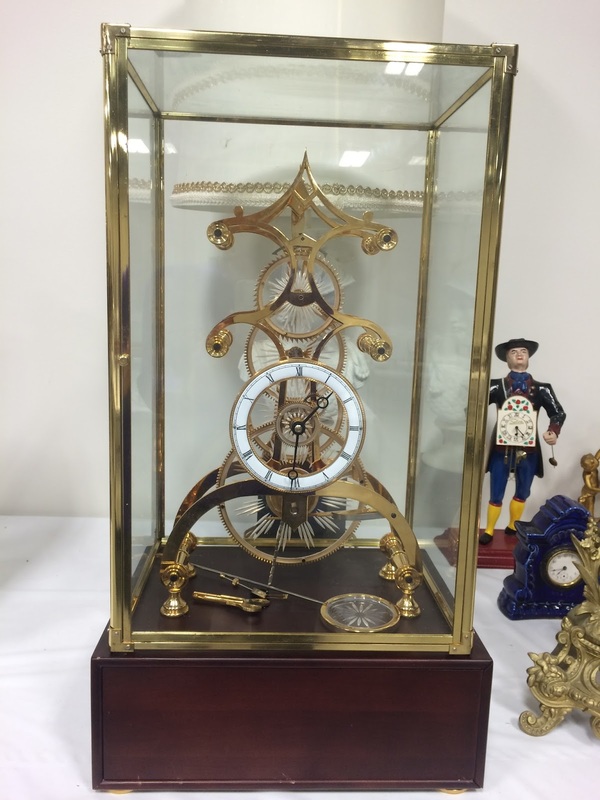 This past week we sold a number of beautiful and unusual clocks for a family that obviously loved these old time pieces as well. Their grandfather clock would have hit most ceilings at 9’7″ tall. There were numerous wall clocks, banjo clocks, and a really neat Dickory Dickory Dock clock where the little mouse from the nursery rhyme moved upwards as the time passed. But the clocks that interested me the most were the “Mystery Clocks.” They were different from most and get their name because it is a mystery how they kept time. Why all this fuss about clocks? Besides the beauty of the timepieces and their wide variety of unique construction, the time that these clocks keep governs our lives. Each strike of the hour reminds us that we live in 24-hour intervals. All our activity revolves around those sweeps of the clocks’ hands. When we are young time seems to pass slowly. But as we grow older the insistent ticking reminds us of how short life is and the urgency of completing our tasks. God is different than we are. He does not live within the confines of time. To Him one day is as a thousand years, and a thousand years like one day. As we scurry around, trying to complete all that needs to be done, we can often become frustrated when God seems to delay. His way of doing things can often be a mystery. Many times He doesn’t answer our prayers according to our time table. As we seek answers for why the ungodly prosper, it may seem that these unbelievers are getting away with their sin. They mock the promise that the Lord will come back, yet God does not seem to respond. But God will do what He says in His Word even if it is not according to our time table. His delays reveal His patience by giving all the world opportunities to repent and turn to Him. In His time He will bring to pass all that He has promised. God does not need a clock to regulate His activity. But if there is a timepiece in heaven, I think it is a mystery clock. Why? Because He works and acts beyond the confines of time as we know it. What is a thousand years to us may only be one day to Him. But like the mystery clock, though we may not understand the inner workings, we can trust Him to accomplish His will at the perfect time. He will never be late or early – He is always right on time. Oh dear, Great Grandma’s clock is now chiming the hour. Another day is almost done!